Community-based organizations have an important role to play in helping many young offenders. The Foundation supports a range of alternative-to-incarceration and prisoner re-entry programs that focus on education, employment training and personal growth and responsibility. Despite limited resources and often-overworked staffs, a number of innovative New York nonprofits manage to provide life-changing alternatives to young people caught up in the criminal justice system. To support those organizations and attract talented students and scholars to the youth justice field, The Pinkerton Foundation has joined with the John Jay College of Criminal Justice to develop a unique fifteen-month internship program known as The Pinkerton Fellows Initiative. Launched in 2012 with the Foundation’s largest grant ever to an educational institution, the Fellows Initiative offers a select group of twelve John Jay undergraduates a paid internship with a leading youth justice community-based organization. After a brief orientation session, these Community Fellows work full-time during the summer and the month of January and several hours each week during the school year, typically at an alternative-to-incarceration program or post-prison reentry program. The Community Fellows also work full time during the following summer. 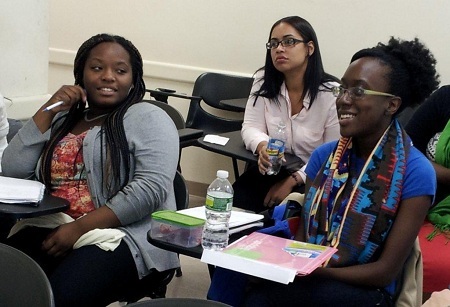 In addition, five John Jay graduate students in forensic psychology – the Graduate Community Fellows – work on a similar schedule providing counseling and other direct clinical support to participants at youth justice nonprofits. All Fellows receive support in the form of wages, stipends and transportation allowances. The Community Fellows also participate in a new John Jay course developed especially for the program on the role of nonprofit organizations in the criminal justice system. In the fall of 2012, John Jay launched a Pinkerton Fellows Initiative series of public symposium on youth justice issues. At John Jay, the Fellows Initiative is administered by the Prisoner Reentry Institute. In 2015, the program received Pinkerton Foundation grants totaling $686,000.